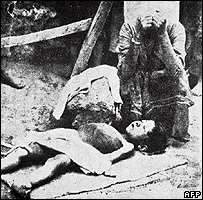 The mass killing of Armenians by Ottoman Turks during World War I remains a highly sensitive issue. Turkey has resisted widespread calls for it to recognise the 1915-16 killings as genocide, while historians continue to argue about the events. There is general agreement that hundreds of thousands of Armenians died when the Ottoman Turks deported them en masse from eastern Anatolia to the Syrian desert and elsewhere in 1915-16. They were killed or died from starvation or disease. The total number of Armenian dead is disputed. Armenians say 1.5 million died. The Republic of Turkey estimates the total to be 300,000. According to the International Association of Genocide Scholars, the death toll was "more than a million". Article Two of the UN Convention on Genocide of December 1948 describes genocide as carrying out acts intended "to destroy, in whole or in part, a national, ethnic, racial or religious group". The dispute about whether it was genocide centres on the question of premeditation - the degree to which the killings were orchestrated. Many historians, governments and the Armenian people believe that they were; but a number of scholars question this. Turkish officials accept that atrocities were committed but argue that there was no systematic attempt to destroy the Christian Armenian people. Turkey says many innocent Muslim Turks also died in the turmoil of war. What was the political context? The Young Turks - an officers' movement that had seized power in 1908 - launched a series of measures against Armenians as the Ottoman Empire was crumbling through military defeats in the war. The Young Turks - calling themselves the Committee of Unity and Progress (CUP) - had entered the war on Germany's side in 1914. Turkish propaganda at the time presented the Armenians as saboteurs and a pro-Russian "fifth column". Armenians mark the date 24 April 1915 as the start of what they regard as the genocide. That was when the Ottoman government arrested about 50 Armenian intellectuals and community leaders. They were later executed. Armenians in the Ottoman army were disarmed and killed. Armenian property was confiscated. Was anyone held to account? Several senior Ottoman officials were put on trial in Turkey in 1919-20 in connection with the atrocities. A local governor, Mehmed Kemal, was found guilty and hanged for the mass killing of Armenians in the central Anatolian district of Yozgat. The Young Turks' top triumvirate - the "Three Pashas" - had already fled abroad. They were sentenced to death in absentia. Historians have questioned the judicial procedures at these trials, the quality of the evidence presented and the degree to which the Turkish authorities may have wished to appease the victorious Allies. Who recognises it as genocide and who does not? Argentina, Belgium, Canada, France, Italy, Russia and Uruguay are among more than 20 countries which have formally recognised genocide against the Armenians. The European Parliament and the UN Sub-Commission on Prevention of Discrimination and Protection of Minorities have also done so. The UK, US and Israel are among those that use different terminology to describe the events. In 2006, Turkey condemned a French parliamentary vote which would make it a crime to deny that Armenians had suffered genocide. The bill did not become law - but Turkey suspended military ties. In March 2010, Turkey withdrew its ambassador to Washington after a US congressional committee narrowly approved a resolution branding the killings as "genocide". The House Foreign Affairs Committee endorsed it, despite the objections of the White House. Barack Obama's administration has called for the resolution not to be "acted upon" by the full Congress. What is the political impact of the row? The killings are regarded as the seminal event of modern Armenian history, binding the diaspora together. Armenians are one of the world's most dispersed peoples. In Turkey, public debate on the issue has been stifled. Article 301 of the penal code, on "insulting Turkishness", has been used to prosecute prominent writers who highlight the mass killings of Armenians. Among them were Nobel laureate Orhan Pamuk and Hrant Dink, who was later shot dead in January 2007. A teenage nationalist is on trial for his murder. The European Union has said Turkish acceptance of the Armenian genocide is not a condition for Turkey's entry into the bloc. Are Armenia-Turkey relations still frosty? After decades of hostility there has been a slight thaw. Turkey and Armenia signed a deal in October 2009 to establish diplomatic relations and open their border. But the deal is yet to be ratified by either parliament, and some in Ankara accuse Armenia of trying to alter the terms of the deal. A complicating factor is mutual suspicion over the frozen Nagorno-Karabakh conflict. Turkey backs Azerbaijan in the dispute over Nagorno-Karabakh, a territory inside Azerbaijan held by ethnic Armenians since a war in the 1990s.